The air is visibly smokey at the 49'ers game- people in the stands wearing masks. I can't imagine it's healthy on the players. Horrific situation there. Paradise, CA, is apparently gone. I caved today and bought a mask to wear in San Francisco as we enter Day 6 of extremely poor air quality from wildfire smoke. The entire Bay Area smells like a camp fire, and despite days of nothing but sunshine, the sun hasn't been fully visible in days. In my house, we've kept all our window shut since waking up to a house full of the smell of smoke last Friday. I've always felt an urgency w/ regard to the effects of climate change, but it's even more heightened now. I was there in mid August when the fires were further north. I know that campfire smell. I just learned yesterday that I have relatives who lost everything in Paradise, CA... one of my mom's cousins (who I don't know and not sure I've met). The family out there was afraid they had died escaping the fire, but they did make it to safety, with apparently only the contents of their car the only thing they have. That's really rough, but glad they are alive and well. It's nightmarish out there this fire season, as all the rain last winter only made things worse this year. The increased undergrowth has become more fuel for the fires as it dried out during the summer months. California is expected to have above average precipitation in the 8-14 day outlook. That will be much needed. 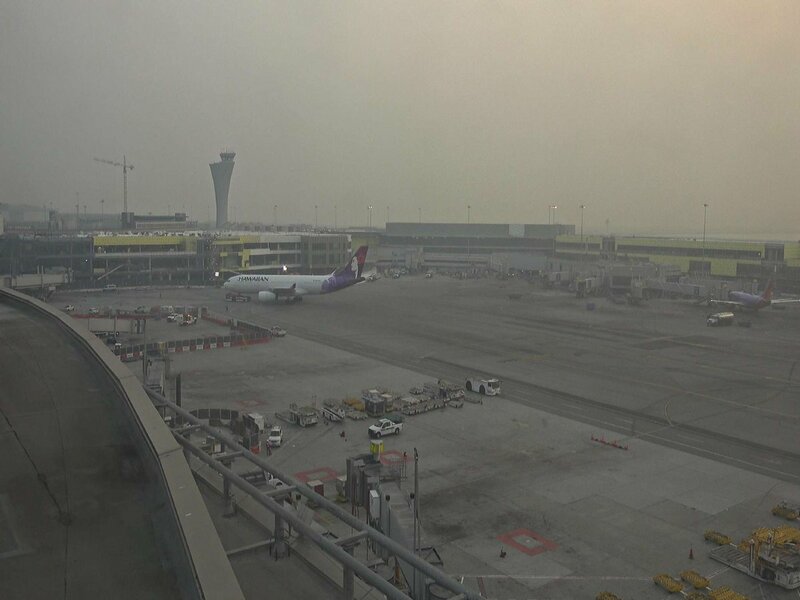 Looks like another smoky sunrise in San Fran. . .
Deadliest in CA history. More than 60 killed and more than 600 missing, almost all of whom are presumably dead. That is an absolutely horrifying number in a modern first world country. On top of that stat, all but 1 of the top 10 most destructive wild fires in CA's history have been in the 21st century. At some point people will need to come to terms with climate change being a real phenomenon. I will leave it at that. Completely agree. The portion of Americans who think humans don't have an effect on climate is concerning. I thought on this board it would go without saying, but I guess not: this is one piece of data among thousands of other data points that supports climate change being real and being caused by man. I use to be a skeptic myself, but after reading all the various studies as they have been completed along with things like the norther polar ice cap's steady decline, glaciers in Greenland melting, dissolved gas in ice core samples, mass coral deaths from ocean pH levels going down, etc etc - I changed my mind Science shows this and science by nature is right whether you want to 'believe' or not. The facts are overwhelming at this point and while sure, your points on the California fires are valid, it does little to invalidate my argument just due to the complex nature of climate. That said though, as far as climate goes there, CA has been very anomalously dry over the past 20 years which breeds wildfires. That will be my last reply on the subject as I do not want to drag politics into the thread - if this were Weather Brains I'd be getting the buzzer from Spann. For whatever reason, we've turned this into a political issue. Furthermore, the two sides are more polarized than ever, and it's concerning to see the level of animosity growing every year between red vs blue, liberal vs conservative. There can be no consensus on this, or any other important issue, when the two sides won't listen to each other or even make an effort to find common ground. We're supposed to be one nation, but lately it's fracturing. It's said that a house divided cannot stand. I don't think the United States has been this disunited since the Civil War. Climate change may be the least of our problems if we can't put aside personal pride and learn to reason with each other again. Completely agree. The problem is it has gone from "What can we do to maker things better" to "What can we do to hurt the other side". Between that and people obsessing over labels for both themselves as well as whatever group they want to hate, it is frustrating. I do not label myself as either right or left, democrat or republican. I have beliefs on both sides of the fence, but I also believe compromise is important and that's something no one is willing to do these days it seems. 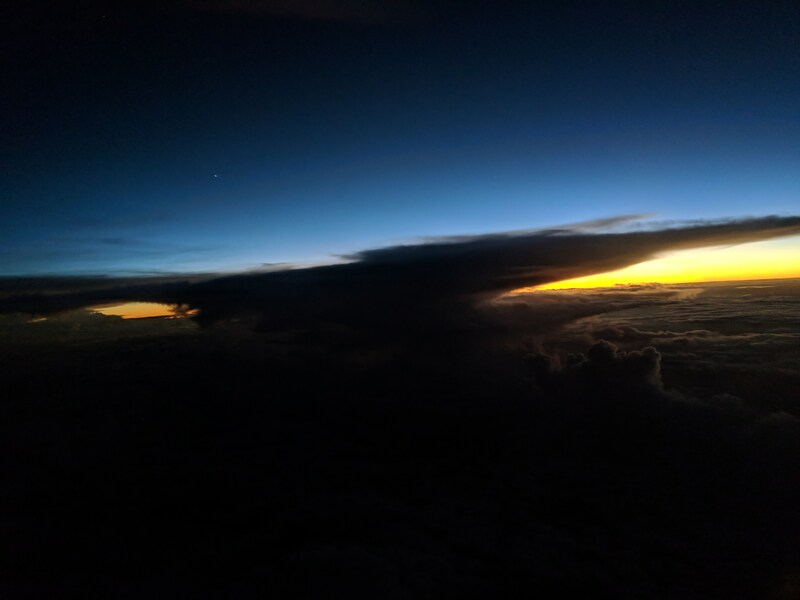 And since this has gone off the rails in a severe weather thread here is a picture I took from the summer of the anvil of a thunderstorm over Texas during sunset I took flying back from Las Vegas back in September. Around 1,000 people missing due to these wildfires now. I don't recall anything like this, even during the worst fires in recent memory. I hope these people found shelter somewhere.